For design pros who need to keep tabs on their font collections, and who are constantly on the lookout for fresh fonts for new projects, Extensis has announced the availability of Suitcase Fusion 4, a brand new version of its professional font manager. This upgrade features an updated interface designed to streamline workflows and save designers time-consuming and distracting back and forth between applications. Other new features include font panels, custom font digests, favorite fonts, preview colors, auto activation plug-ins for Adobe Creative Suite software, and increased Web font capabilities with the addition of integration with Google Fonts. 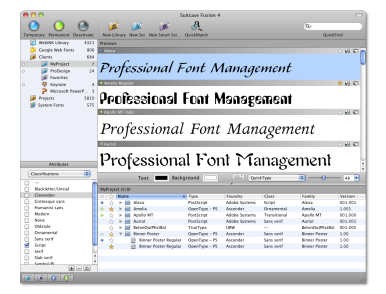 Fusion 4 allows users to view, access, sort, browse, and curate their fonts faster and more easily. 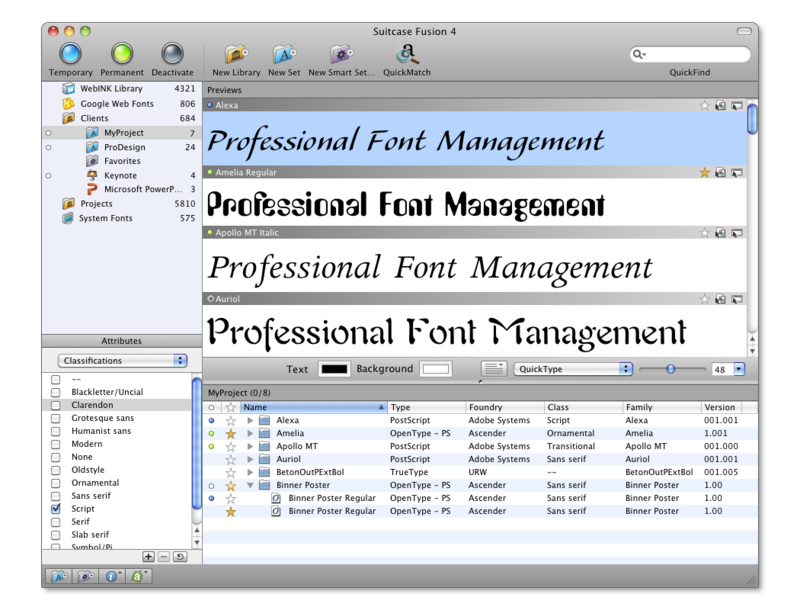 Suitcase Fusion 4 now allows designers to create and edit their own custom font lists, called Font Digests. These Digests provide a powerful way to set up specific lists of fonts from extensive Suitcase libraries. Everybody has favorites, and now designers can star fonts as Favorites so they can quickly find, preview, and use them in their projects. Suitcase Fusion 4 also now offers a built-in color picker to choose the text and background color directly within the application’s Previews window. 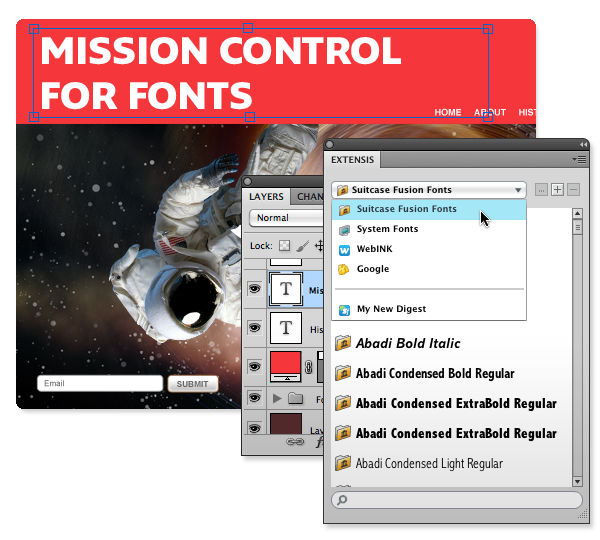 New Font panels in Adobe InDesign, Illustrator, and Photoshop offer direct control of font browsing so designers can now preview, organize, and activate fonts from their font collection directly within these Adobe applications. That makes it easier to find and use the right font. Plug-ins for Adobe InDesign and Illustrator are now supported for CS3, CS4, CS5, and CS5.5. Plug-ins for Photoshop are supported for CS4, CS5, and CS5.5. Editorial types also benefit from the new version as Fusion’s InCopy plug-in now supports CS4, CS5, and CS5.5. Plug-ins for CS6 are in development and will be released as a free update for Suitcase Fusion 4 sometime after the launch of CS6. For QuarkXPress, XTensions are available for versions 7, 8, and 9. While the previous version of Suitcase Fusion featured WebInk Web fonts for online designs, a new font panel for Adobe Photoshop includes Web fonts from WebInk as well as Google Web Fonts. Designers can now preview Web fonts using any text, and integrate them into Photoshop site mockups for free. The new Google Web Font capability provides hundreds of free, open source fonts for use in any project. Suitcase Fusion 4 is available immediately for $100 on both the Mac and Windows platforms. Upgrades from previous versions are $50. You can order Suitcase Fusion 4 directly from the Extensis website. The program ships in English, French, German, Japanese, Italian, Spanish and Brazilian Portuguese. Suitcase Fusion 4 runs on Mac OS X 10.5.8 or higher on a 1.6GHz or faster Intel processor. It requires Safari 4 or higher, Firefox 3.6, or Google Chrome 10 or higher. On the Windows platform, Suitcase Fusion requires XP SP3 (32-bit version only), Vista SP1 (32-or 64-bit), or Windows 7 (32-or 64-bit) on a 1.6GHz or faster processor. The browser specs are the same as on a Mac, with the addition of Internet Explorer 7 or later.